Now that I have seen the entire True Blood TV series and all of the Sookie Stackhouse novels that they were based on, I have been thinking about the differences between the two and was thinking about writing up a post. This is certainly not intended to be an exhaustive list–there could easily be a book written listing out all the differences, especially since after the first few books/seasons, the two plots diverge wildly in almost every respect. So, I am only going to note a limited number, and the ones which I found the most striking, because I find it interesting to compare adaptations of a fictional universe to different media formats. Obviously, this will be spoiler rich, as I will be covering some major plot points for the entire run of both the TV and movie series. 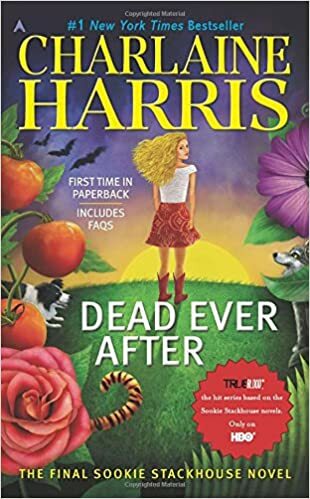 Dead Ever After is a romance/mystery/horror novel from 2013, the thirteenth and final book in the Sookie Stackhouse series of novels by Charlaine Harris (which is the basis of the HBO show True Blood). The previous books are all reviewed here earlier on the Diabolical Plots feed. Deadlocked is a romance/mystery/horror novel from 2012, the twelfth in the Sookie Stackhouse series of novels by Charlaine Harris (which is the basis of the HBO show True Blood). The previous books are all reviewed here earlier on the Diabolical Plots feed. In the last book, Eric, Pam, and Sookie succeeded in killing the vampire Victor, the representative of the king of this vampire district. As the book starts, Felipe de Castro, the aforementioned king, visits the area to investigate the disappearance. Eric hosts a party in his honor, and during the party, a dead woman is found on the lawn of Eric’s house. Meanwhile, Sookie is struggling with the quesiton of what to do with the magical fairy artifact left to her by her grandmother which will grant her one wish. Dead Reckoning is a romance/mystery/horror novel from 2011, the eleventh in the Sookie Stackhouse series of novels by Charlaine Harris (which is the basis of the HBO show True Blood). The previous books are all reviewed here earlier on the Diabolical Plots feed. Sookie witnesses the firebombing of Merlotte’s (the bar where she works). Before Sookie gets to the bottom of that, she finds out that her vampire boyfriend Eric is plotting to kill the king of his vampire district, and she is drawn into the plot. She has also been chafing at the blood-bond between her and Eric that makes a telepathic feedback loop between the two of them. Dead in the Family is a romance/mystery/horror novel from 2010, the tenth in the Sookie Stackhouse series of novels by Charlaine Harris (which is the basis of the HBO show True Blood). The previous books are all reviewed here earlier on the Diabolical Plots feed. At the end of the last book, Dead and Gone, Sookie was tortured at the hands of two fairies that were part of the opposing faction of the short-lived but brutal fairy war. As this book starts, she is still recovering from both the physical and psychological aftermath of this horrific treatment, with the help of her friends and her boyfriend the vampire Eric Northman. Things begin to get very complicated when Eric’s maker, the ancient Roman vampire Appius Livius Ocella, shows up with another vampire he has made–Alexei Romanov, the last son of the last Czar of Russia who witnessed his entire family slaughtered and is still suffering from emotional imbalances even these decades later. Sookie is asked to babysit the child of her (dead) cousin Hadley, who is also telepathic, and she helps him deal with social situations. Meanwhile, Bill is still ill from the silver poisoning he got during the fairy war. If his maker were still alive, she might be able to heal him, but the only chance is another vampire made by his maker–and Bill doesn’t want to contact her. Dead and Gone is a romance/mystery/horror novel from 2009, the ninth in the Sookie Stackhouse series of novels by Charlaine Harris (which is the basis of the HBO show True Blood). The previous books are all reviewed here earlier on the Diabolical Plots feed. Before the series of books, the vampires of the world had publicly revealed their existence, but since then Sookie has learned of many other supernatural beings living among us as humans. Among them are the shapeshifters, including werewolves and wereanimals of other types. Now that they’ve had time to observe how the vampire revelation has gone, the shapeshifters have finally decided to make their big public reveal, outing themselves to the public both in a general sense and with individual members of communities revealing themselves at once. The reveal in Bon Temps seems to go pretty well, until Sookie’s werepanther sister-in-law is found crucified outside Merlotte’s where she works. From Dead to Worse is a romance/mystery/horror novel from 2008, the eighth in the Sookie Stackhouse series of novels by Charlaine Harris (which is the basis of the HBO show True Blood). The previous books are all reviewed here earlier on the Diabolical Plots feed. After surviving the deadly bombing of the vampire summit, and surviving the aftermath of Hurricane Katrina, Sookie just wants things to get back to some semblance of normality. But her boyfriend Quinn (a weretiger) is missing, she learns that she is descended from fairies and meets her great-grandfather who is fairy royalty, she is recruited to help investigate a series of mysterious werewolf disappearances, and the vampire King of Nevada seeks to wrest control from the wounded and bankrupted Queen Sophie-Ann of Lousiana. So, well, I guess that is normality for Sookie. All Together Dead is a romance/mystery/horror novel from 2007, the seventh in the Sookie Stackhouse series of novels by Charlaine Harris (which is the basis of the HBO show True Blood). The previous books are all reviewed here earlier on the Diabolical Plots feed. Sookie is invited to a national vampire summit as part of Queen Sophie-Anne of Louisiana’s entourage. Sophie-Ann knows of Sookie’s mindreading abilities and wishes to user her ability to give her an advantage in expected power struggles within the vampire hierarchy. Sophie-Anne stands accused of murdering her husband (during the events of the last book) and one of the events happening at the summit is her trial, with charges pressed by her husband’s second-in-command. Also at the summit is Barry, the only other mindreader she knows, who is now employed in a similar position as Sookie to use as an advantage in vampire scheming. The anti-vampire church the Fellowship of the Sun has been ramping up their hostilities against vampires lately, and so security is extra tight. 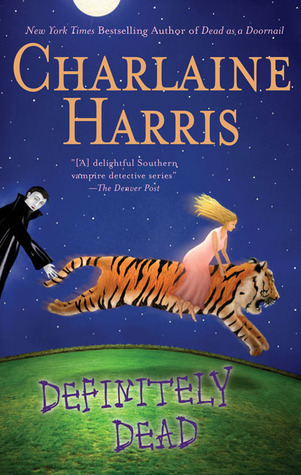 Definitely Dead is a romance/mystery/horror novel from 2006, the sixth in the Sookie Stackhouse series of novels by Charlaine Harris (which is the basis of the HBO show True Blood). The previous books are all reviewed here earlier on the Diabolical Plots feed. Sookie heads to New Orleans to sort out of the affairs of her cousin Hadley who had been turned into a vampire and then killed. Hadley’s apartment has been placed under a stasis spell placed on it by Hadley’s landlord, the witch Amelia Broadway. Shortly after the spell is lifted, a newly-made vampire (the werewolf Jake Purifoy) rises within the apartment and attacks them. Sookie’s new boyfriend, the weretiger Quinn, is also in New Orleans on business, so he helps with the investigation. With the help of Amelia and her coven of witches they set out to discover how Jake came to be newly raised in that apartment on the same day that Hadley died. Dead as a Doornail is a romance/mystery/horror novel from 2005, the fifth in the Sookie Stackhouse series of novels by Charlaine Harris (which is the basis of the HBO show True Blood). The previous books are all reviewed here earlier on the Diabolical Plots feed. Sookie’s brother Jason, bitten by a werepanther, joins the local werepanther pack that lives in the nearby close-knit community of Hotshot (where the werepanther that bit him came from). Sam Merlotte is shot by an unseen shooter, and so is Calvin Norris the pack leader of Hotshot, and Sookie learns that other shifters have been shot all over Louisiana. Colonel Flood, leader of the Shreveport werewolf pack, is hit by a car and dies, and someone shoots Sookie as well(presumably because she associated with shifters). Although the existence of vampires is now public knowledge all over the world, shifters are still a closely kept secret, and so the common element of these shootings is not known to police, but Sookie can’t really tell them the common element either.